Fill these doughnuts with jam or jelly of your choice. Sprinkle with confectioners' sugar, or roll in granulated sugar. These marvelous goodies will be gobbled up quickly!! 1). In a large mixing bowl stir together 1 1/4 cups of the flour, the yeast, and cinnamon; set aside. 2). In a medium saucepan heat and stir water, sugar, cooking oil, and salt just until warm (120-130 degrees F/48-54 degrees C). Add oil mixture to flour mixture; add egg and vanilla. Beat with an electric mixer on low to medium speed for 30 seconds, scraping the sides of the bowl constantly. Beat on high speed for 3 minutes. Using a wooden spoon, stir in as much of the remaining flour as you can. 3). Turn dough out onto a lightly floured surface. Knead in enough of the remaining flour to make a moderately soft dough that is smooth and elastic (3 to 5 minutes total). Shape dough into a ball. Place in a lightly greased bowl, turning once to grease the surface of the dough. Cover and let rise in a warm place until double in size (about 1 hour). 4). Punch dough down. Turn dough out onto a lightly floured surface. Divide in half. Cover and let rest for 10 minutes. 5). Roll dough, 1 portion at a time, to 1/4-inch thickness. Cut dough with a floured 2 1/2-inch (for larger doughnuts, cut dough with a 4-5 inch round biscuit cutter) biscuit cutter, dipping cutter into flour between cuts. 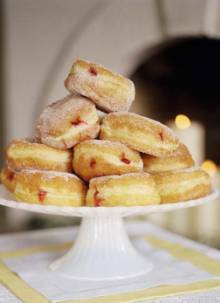 Place about 1/2 teaspoon ( 1-2 teaspoons if making larger doughnuts) jam or jelly onto the centers of half of the circles. Lightly moisten edges of circles; top with remaining circles. Press edges together to seal. Repeat with remaining dough and fillings. Reroll and cut trimmings. 6). Fry filled doughnuts, 2 or 3 at a time, in deep hot oil (365 degrees F/185 degrees C) about 1 minute on each side or until golden, turning once with a slotted spoon. Remove from oil; drain on paper towels. 7). Sprinkle with confectioners' sugar or roll donuts in granulated sugar. Cool on wire racks. Makes about 24 small or 12 large doughnuts. the recipe is perfect, it tastes good!